The West Gate marks the western entrance to the Highway 60 corridor of Algonquin Provincial Park (km 0.0). 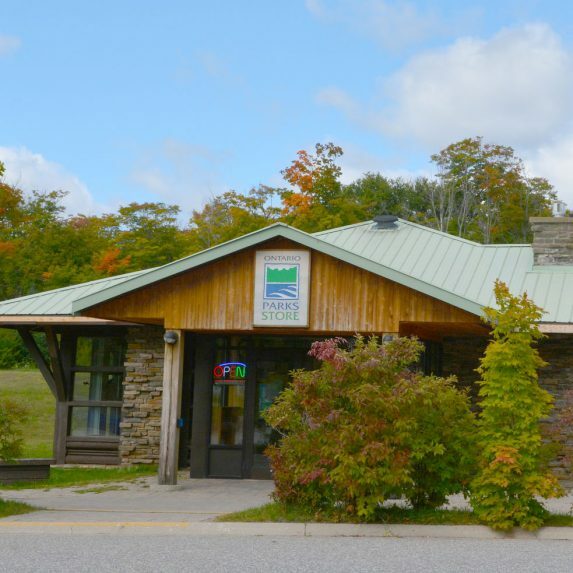 Marked by two large flag poles and a large birch bark sign, this Park office provides information,permits, and bathroom facilities. The West Gate is also home to the Fen Lake Ski Trail. The eastern entrance of the Highway 60 corridor of the Park is marked by the East Gate. The West Gate of Algonquin Park is at km 0.0 of Highway 60. The West Gate is 43.6 km east (on Highway 60) of the junctions of Highways 11 & 60 in Huntsville, Ontario.